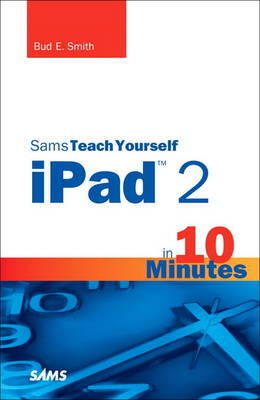 Sams Teach Yourself iPad 2 in 10 Minutes 2/e offers straightforward, practical answers for fast results. By working through the 10-minute lessons, readers learn everything they need to know to quickly and easily use the newest version of the iPad. Step-by-step instructions walk r... read full description below. Bud Smith is one of the most experienced and prolific authors writing about technology today. He has been on the cutting edge of technology introductions from the Intel 80386 microprocessor in the mid-1980s, to cutting-edge coverage of Web authoring in the 1990s, and the iPad 2 and the latest version of Facebook today. Bud has also written about climate change and planning and installing green roofs. Bud's most recent title before this one is Sams Teach Yourself Facebook for Business in 10 Minutes, with in-depth coverage of the new fan page and other features that give businesses a voice on Facebook. Bud began writing computer books back in 1984, the year of the iconic 1984 television commercial for the Macintosh. An early success was the Computer Buyer's Guide for Que, covering the then-latest and greatest in computer hardware and software. His books have sold more than a million copies in total. Bud continues to work as a writer, project manager, and marketer to help people get the most out of technology as it advances. He currently lives in the San Francisco Bay Area, participating in environmental causes when he's not working on one of his many technology-related projects.